John Di Natale grew up on a small farm in the town of Cockatoo in the Dandenongs outside Melbourne. His early years were spent watching his parents work hard to carve out a life for their family after migrating from Southern Italy years earlier. John’s parents were committed to ensuring he and his younger brother got a good education so they could get a ‘good job’ and not have to work as hard. 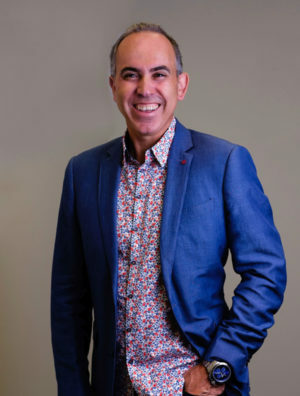 After completing a Bachelor of Arts and initially working in recruitment, training and consulting, John spent a few years on air at radio stations in regional Victoria. On returning to Melbourne, he joined a leading franchise consultancy and was introduced to this powerful methodology for business growth. John’s speaking and presentation skills secured him an international role with the Audi Academy. As part of the Asia Pacific team based out of Singapore, he worked throughout SE Asia, helping to strengthen the Audi brand profile in new markets and training staff from executive level through sales and after sales. John’s early financial ‘education’ taught him that money is hard to get so you have to land a good job, work hard and save to pay off your debts – and that honest people never get rich! After many years of consulting to business owners and entrepreneurs in Australia and around the world, John realised that these views are entrenched in the mindset of many people. He began a new mission to share a more positive, encouraging view and a deeper understanding of money. Together with his team at Equi Wealth, John now helps people understand and manage their money better so they can create a more fulfilling, more rewarding life.